As the trial is about to start, I take my place with the other CCHR staff in the protest area behind the barricades. Although it is early morning and a work day, the area is packed. The crowd is comprised of many different people: monks in bright saffron robes; older women, some of them relatives of the detained, holding megaphones or Buddhist flags; human rights observers, identifiable by their dark blue vests imprinted with NGO logos; and photojournalists carrying conspicuous DSLRs. The conditions outside are not favorable for a protest – the sun is already unforgiving at 8 am, and security agents in riot gear add a foreboding presence to the scene. For the first hour, most are in good spirits. A woman approaches the barricades, leans over, and shouts in Khmer through the hand-made tin megaphone she carries. Mid-sentence, she bursts out laughing, and the police officer facing her on the opposite side also laughs. For some of the agents assigned to protect the courtroom, it is apparently just the barricade that divides them from the protestors. Suddenly, a deafening cheer erupts from those closest to the barricades and spreads to the back of the crowd. A lack of fluency in Khmer means that I am completely lost. I tap the shoulder of a local intern, Bunly, who is standing beside me. “What just happened?” I ask, already guessing the answer. “The 23 have been released!” Bunly informs me, as he listens to the rapid-fire statements of the megaphone owners. Despite the guilty verdict, the crowd is ecstatic. Women are shouting into megaphones, and the protestors eagerly repeat their words, a synchronized and jubilant wail. Attendees are laughing, crying, hugging, and affectionately patting each other on the backs. A petite elderly woman wearing a sunhat that nearly covers her face approaches our group. Grabbing my hand and looking up at me with teary eyes, she says, “Aw-koon.” Thank you. I am confused at the gratitude, as I have done nothing to secure the release of the 23. But she, and others who later walk by and express similar sentiments, are thankful that there are human rights observers in attendance; it is a sign to them that the international community is concerned. 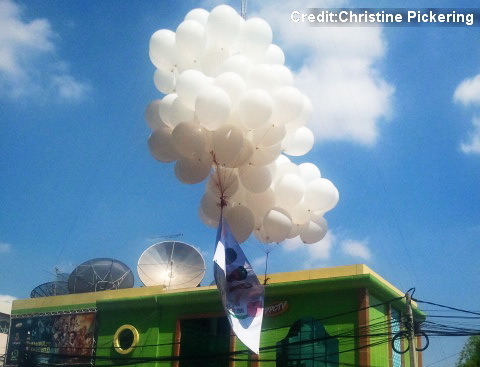 Before the protesters disperse, white helium-filled balloons are released into the sky – a symbolic representation for the freed 23. Although a guilty verdict was handed down today, the joy of the crowd has not been dampened. For the people waiting outside the courtroom – mothers, wives, friends, and union members of the detainees – standing in the heat, shouting for hours on end, and suffering dehydration has been well worth it. The release of the prisoners signals a mission accomplished. The protesters have left the scene, the released balloons are long gone, and the 23 have been freed; but the political climate has not changed. And until citizens’ right to freedom of peaceful assembly is respected, the courts are given independence from the government, and the ruling party develops the political will to accept and allow dissenting voices, it will remain unchanged. 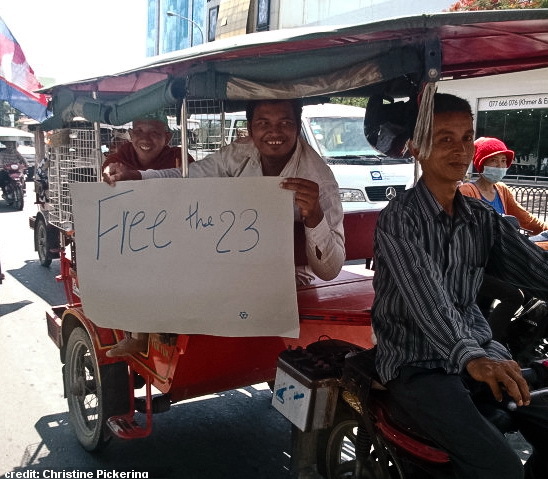 This entry was posted in Freedom of Assembly, Freedom of Expression, Human Rights Defenders, Judicial Reform and tagged Cambodia, Free the 23, Freedom of Assembly, Human Rights Defenders, Justice by Cambodian Center for Human Rights. Bookmark the permalink.